Mazda CX-3 2.0 SE-L Nav + 5dr Auto 2019 Review | What Car? What Car? will save you at least £1,023, but our approved dealers could save you even more. Good looking, well equipped, and featuring an easy-to-use infotainment system, the Mazda CX-3 is not without its charms. 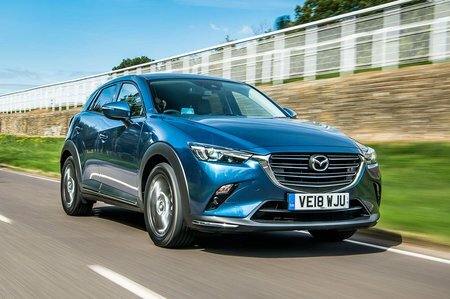 However, the naturally aspirated petrol engines feel weak compared to their turbocharged rivals, and the CX-3 isn't particularly refined at speed. Meanwhile, there are more practical small SUVs to choose from in terms of rear seat and boot space. The least powerful petrol delivers decent performance; 0-62mph for the manual version is a respectable 9.0sec. But it will only provide that kind of pace if you’re willing to rev the bejesus out of it; there’s no turbocharger, you see, and if the revs drop below 2500rpm, especially in higher gears, it’s about as accelerative as a somnolent slug. Despite having half its capacity, the turbocharged Seat Arona 1.0 TSI 115 has more low-end surge. Still, keep the CX-3's revs above that region and there’s reasonable pick-up for keeping with the flow of motorway traffic, and take cost into account and this is our pick over the 1.8-litre diesel.